Like you already know,whiteraven did a lot of revision for the HQ model for battle.He isn't able to convert them to field model because he had problem with kimera.So I've decided to help out by converting them to field model and make it look as good as possible. Included all convertable Cloud models. All this could take some time so be patience,friends. when the Raven turns white.. Thanks man, some people have been asking for this for a while now, I know many will appreciate this, Thanks Again..
Well done here buddy, I hope you continue with the other models..
That's a lot of thanks.And here I thought I should be the one to thank you.My work is not THAT hard,it's just take a long time. Well as mentioned above,I'm gonna release another version that leaner,original work you've done. P/s:Maybe you shouldn't call me "buddy".I'm sure I'm a lot younger than everybody around here. LoL, I don't really mind calling anyone buddy when I get along with him/her no matter the age gap, Lol I believe we're all kid's at heart here .. but if it bothers you then I wont call you buddy ..
You don't mind?Never mind then.It not bothering me either.Call me whatever you wish. From now on,I'll have to study like 13-14 hours per day(except for Sunday)so I won't be able to do much with this until next weekend. Thanks for the Cloud Field appreciate it. Could you do Tifa next? I just started a ng and can't find a descent Tifa field model anywhere. Jka is good but her hair is transparent. Using that until your Tifa release. Okay,I'll do it when I have finished the unmodified Cloud model requested by whiteraven(almost). But for now,i'm waaaay too busy with high school stuff.It took a lot longer than I thought.Sorry, can't be helped. LoL, you don't have to rush it.. it's always better to take your time.. since rushed work sometimes result to poorer quality.. I know.Thanks for the advice. I gotta size the leg down cuz if I don't,the leg will be too long and so the animations will be jumpy. How about Vincent's? 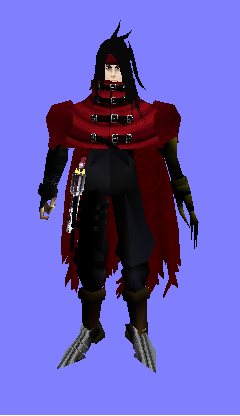 I haven't seen any hq models for field Vincent's, and I saw WhitEraven's Battle model file and it was awesome. So I tried to convert it to A field model. Everything was already fine (though I did have to resize a lot and rotate some stuff. Man, the feet are hard to get right!) The problem is, I can't rip the textures off the **aa file, except for the gun, which isn't really on the field model (unless maybe I merge it with the arm bone or something...). anyway, can you guys help on the ripping the texture thing? Or maybe send the texture files themselves? It'd be awesome if this works (btw, how can you attach an image? I can't post what I've done so far) Thanks! You'll need permission to upload it when you're done, but you're free to do whatever you like for your own use. Usually the texture on battle models are **ac, **aa is the skeleton. You can add anything to any piece you like, for instance his gun to his hand, by just clicking add part to bone. Vincent doesn't carry his gun in the field at all though so that will look odd. You can try adding it to the side of his right leg though, that's where he carried it in AC and DoC. The menu button above, "insert image" then just paste in the url of your image. Usually the texture on battle models are **ac, **aa is the skeleton. You can add anything to any piece you like, for instance his gun to his hand, by just clicking add part to bone. Vincent doesn't carry his gun in the field at all though so that will look odd. You can try adding it to the side of his right leg though, that's where he carried it in AC and DoC. Thanks. from what I know, he used around 4 or 5 textures here. The thing is, those can't be read by biturn, so I can't export them as image files which I can apply to the .p files. Someone told me that the problem was probably the resolution and that biturn can't support textures, so it can't convert them to an image or tex file. So, unless I can get a converter that can handle the resolution of WhitEraven's texture or get the texture files themselves, I'm stumped. You don't export the textures. Copy them onto your desktop and click rename, and just add .tex to each one. Now you'll be able to apply them to the field model. You wont need all five though. I haven't looked at the textures for this model, but that probably includes most of his weapons. You only really need the main one which is *ac, and any other that covers the body. Worry about the others later till you decide to add a weapon. You're pictures are too small. Also post them as pictures not links so they'll show in your post. From what I can tell the field model looks too thick. You want it to match the battle model as closely as possible. Vincent is pretty skinny. Redo your pictures and we can give it a closer look. Ore no Imouto ga Konna ni Kawaii Wake ga Nai. It's a really good one, though the ending kinda bummed me out.